Ask most rock stars to pitch in for the environment, and they might pen you a pop tune. Kazutoshi Sakurai and Takeshi Kobayashi can do that  Sakurai is the lead singer of Mr. Children, the second highest-selling rock band in Japanese history, and Kobayashi is one of Japan's top music producers. But the two know that We Are the World can only do so much to save the earth  environmental solutions also need cold, hard cash. That's where AP Bank  the name stands for Artists' Power or Alternative Power  comes in. Together with the Japanese composer Ryuichi Sakamoto, Sakurai and Kobayashi in 2003 founded and funded the nonprofit lending group, which finances environmentally friendly projects. The three men personally provided nearly $1 million of seed money (Sakamoto has since stepped back from the venture as he now spends much of his time abroad), which is channeled to small-scale, sustainable schemes that mainstream banks would typically shun in favor of lending to bigger, stodgier companies. The bank has provided money for projects ranging from a recycling program in the far south of Kyushu to the construction of an eco-resort in the Marshall Islands. "When I thought about what I could do as an individual, the environment came up," says Kobayashi, AP Bank's president. "Money for the sake of money isn't great, but money is a tool, and people can use it as a community." Kobayashi and Sakurai are decent bankers  it helps that they have a former manager at the monster Japanese lender Sumitomo Mitsui on board  but they're better musicians, so they've augmented AP Bank's lending program with an annual festival designed to raise money and awareness for the environment. 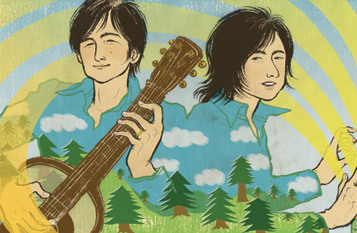 Japan's pampered pop stars might not have as finely tuned a sense of activism as those in the U.S. and Europe, but Kobayashi and Sakurai have the clout to draw their peers and their multitudes of fans toward environmentalism  and to demonstrate how much can be achieved when celebrities find innovative uses for their fame. "I think that because they started this movement, it's helped ordinary folks become aware of environmental problems and finance," says Kazuyuki Tsuchiya of the green group A Seed Japan. It's the least a couple of rock-star bankers can do.